It was looking good. BBC Weather said it was 10c out. Perhaps it might wake up the fishes a bit. So Viaduct Fishery it was. Match lake (i'm obsessed with this lake, and must go elsewhere). Today I was joined by Technical guru and all round nice chap. Steve Baumgardt (i have probably spelt it wrong... but it is better than Bumgardt. Yes that has happened). 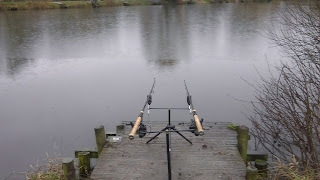 Before he arrived I kitted up both rods. One with a chunk of lead on the end and a big dollop of cheese. The other with a chunky weighted Waggler and... a big dollop of cheese as well! Reaching for the float rod I nearly fell onto the deck. The bite alarm was bleeping loudly! I picked up and stuck. I was into a fish! The lead must have literally clonked him on the head. He certainly wasn't suffering though. Immediately he headed towards a low lying tree. My line was quickly snared in its spindly branches. I knew what was about to happen. A loud crack echoed around the lake... Line snapped . Fish lost. I set up again and then Steve arrived. He is far to macho to fish the match lake. 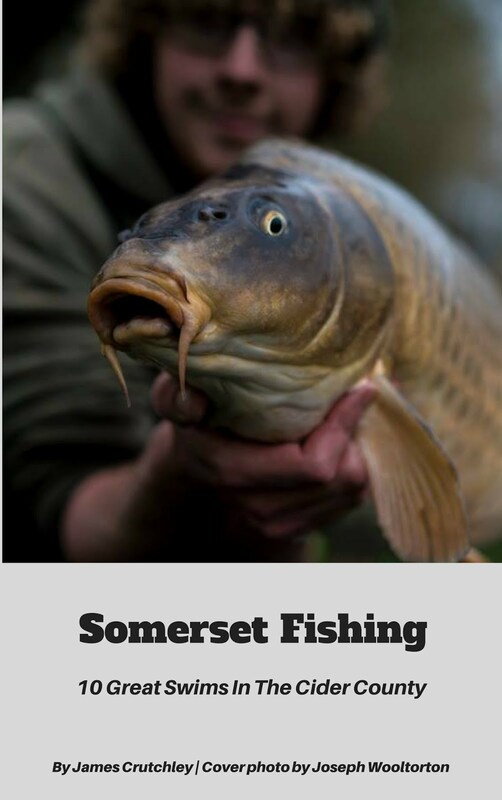 He has got proper carp gear. Chunky and full of testosterone (the gear that is. Steve isn't quite as pumped up as he used to be). The rain was falling. 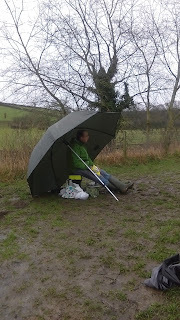 Steve's PVA bags were melting but he set up his carp rods. Steve, wishing it was summer. Fortunately he had brought along some tea and chunky kitkats which cheered everyone up. Half an hour slid by. I was feeling uncomfortable on this new lake. It was big and I just didnt like it! Back at Match I was feeling confident. I was going to catch loads. 4 hours passed and I had one bite which I missed. The sun was getting heavier and soon struggled to stay above the ridge above me. I was going to have a blank day. The song from Blankety Blank played in my brain. In a last desperate bid for something I cast tight to the margin about 7 feet from my peg. I balled in a load of bread creating a small cloud of tastiness in the water. The float bobbed slightly. I thought it was a Roach giving it a go. I didnt care as long as I caught something. The float bobbed again and very slowly slid lower in the water. I struck into it. This wasnt a Roach. The last light was holding on tenuously. My reel was giving out line pretty fast. It was certainly a carp but how big?